We pet lovers are so fortunate to have the variety of high-quality dog and cat foods that are available to us these days. Many of us barely have time to cook properly for ourselves, let alone our pets, so the option of healthful prepared food is one that we’ve embraced wholeheartedly. A little too wholeheartedly in one respect. What am I talking about? Free feeding — the practice of just pouring dry food into a bowl, leaving it out for pets to nosh on at their leisure and refilling it when it starts to get low. I have to tell you: That’s a recipe for disaster in both dogs and cats. Take dogs. Their ancestors were scavengers and never knew when or where their next meal would come from. When they got food, they binged (and then purged back at the den to feed their pups). Our dogs today are still genetically programmed to eat as fast and as much as they can stomach when they belly up to the food bar. So can we expect them to switch off their hardwired habits and eat with moderation? I don’t think so. Cats have a history of being hunters. Hunting means being awake, moving and going in for the kill, all of which burns calories. That’s a far cry from the lifestyle of today’s pet cats. These days, the only animal our cats love to listen for is the human family member in charge of opening the cupboard door and pouring out kibble or plopping some wet food into their dishes. Getting up from their beds to mosey over to the food bowl isn’t the equivalent of hunting — it doesn’t constitute an appropriate amount of exercise, and it sure doesn’t consume many calories. Cats who have food available all the time don’t get satiated, and if they don’t exercise, they don’t burn fat. That makes them prone to obesity and diabetes. Our job, as their human caretakers, is to limit the amount of food our pets eat. How much your dog or cat needs depends on breed, life stage (puppy, kitten, adult, senior), activity level, whether he’s altered or intact, and his genetic predispositions. For instance, if your dog or cat is of a breed that’s prone to heart disease, you want to protect his health by not letting him become overweight or full-on obese. Work with your veterinarian to determine an appropriate weight for your pet and exactly how much of which food to give him. The guidelines on the bag are a start, but every pet is an individual. 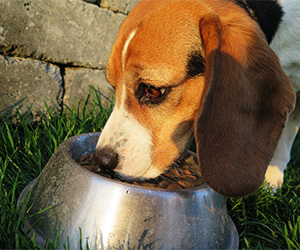 You may need to adjust the recommended amount, depending on whether your dog or cat needs to gain or lose weight. Schedule regular meals instead of leaving food out all day and measure amounts precisely. No guesstimating! Level off that measuring cup instead of heaping it high. In the Becker household, with both our dogs and our cats, we measure out food to the closest eighth of a cup. And all of our pets, I can swear, are on the thin side and at their ideal body weight. As a result, our five dogs and three cats will have a greater chance of limited health problems and more years on this earth. If the idea of a regular mealtime doesn’t work for you, I have an even better suggestion. Measure out a day’s worth of your pet’s food and put it inside a food puzzle. He’ll have to “hunt” for his food by pushing or otherwise manipulating the toy. That helps him burn calories, stay alert, revive his hunting instincts and ensure that he doesn’t inhale all of his food at once. Your dog or cat will have a more interesting and “full-filling” day.